Here’s the dirt on cleaning up your garden in the fall. Before you begin clearing out your tomato patch, make notes about this year’s layout. Record where you planted tomatoes and what variety in a gardening journal. Note what worked well so you’ll have a log of successful varieties. Your layout records will also help you know where to plant and where not to next year. Crop rotation helps reduce diseases and improve the soil. Pull up spent tomato plants and weeds, collect dropped or “mummified” fruit, and rake the garden to remove plant remnants. Burn (see below) or discard plant materials, including roots. It may be tempting to simply till this organic matter into your garden to break down or add it to your compost pile. But beware. 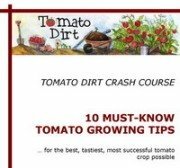 Fungi, bacteria, insects, and larvae that affect tomatoes – including septoria leaf spot, early blight, late blight, fusarium wilt, verticillium wilt, and bacterial wilt – overwinter in the garden. You might also consider piling discarded tomato debris in your tomato patch, along with gathered autumn leaves, straw, yard clippings, and other garden remnants. Then burn them. Burning adds wood ash to your garden and also destroys weed seeds, fungi, bacteria, and other microorganisms that overwinter in the soil. Be sure to obtain necessary local permits for burning. Have a working garden hose on hand to contain burning. The ash helps replace all of the trace minerals in the soil, allowing them to migrate from the roots to the leaves in any plant so when the leaves are burned, the trace metals are in the ash. A good suggestion is to break the ground deeply before you burn. Breaking the hardened soil allows moisture from the winter rains to be deeply absorbed. This step will greatly improve the quality of the soil for your upcoming crop as it will allow the ash (and associated nutrients) to be restored. If you don't have farm equipment, you may wish to use a middle buster or plow attachment, as most tillers will not penetrate the soil deeply enough to break the hard pan beneath the topsoil. Turning the soil with a spade also works. Retest soil in the spring to determine its adjusted pH after burning. A spade or a tiller/cultivator will help aerate the garden and encourage elimination of microorganisms over winter. There’s no need to finely till right now. Save that for spring. 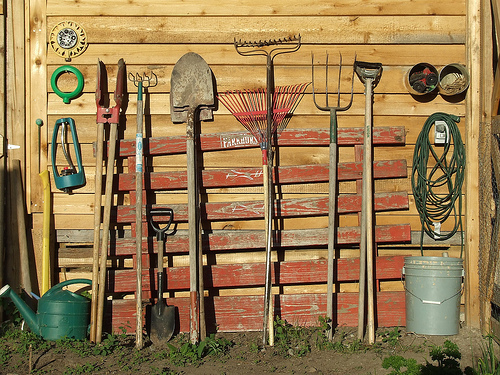 Assemble your wheelbarrow, , spades, , trowels, and garden pruners. Rinse off excess soil with a garden hose. Scrub surfaces with disinfectant and a 10% bleach solution. Allow tools to dry. Oil metal tools to prevent rust. Store tools for winter. Follow manufacturer’s instructions for winterizing power tools. Make sure applications are properly labeled and tightly sealed. Place them in a dry, safe location where they won’t freeze. It’s a good idea to record your garden layout and notes about this year’s crops throughout the growing season in a gardening journal. You can also clear out garden debris as it accumulates. Once the first frost has killed local annuals, your garden clean up can press forward in earnest. If you live in an area that doesn’t get frost, take your cue from flower gardens anyway. Watch to see when summer annuals turn brown and die. That tells you it’s time to clean up your tomato garden this year.